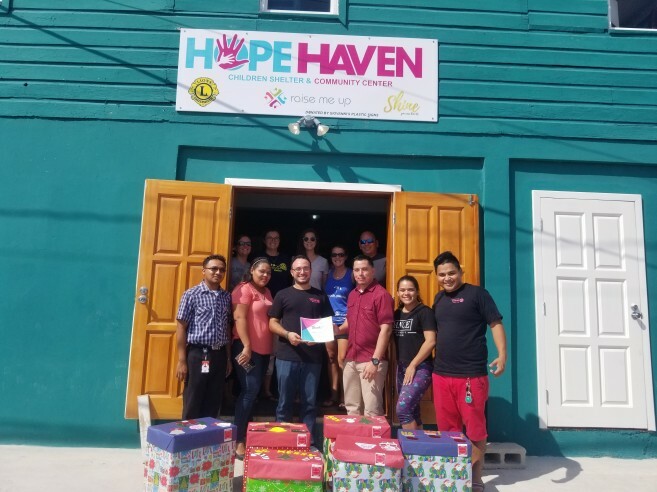 Thanks to the Merry Boxes Campaign, 50 unprivileged families across Ambergris Caye were able to spend a happy Christmas Day. The Rotaract Club of Amerbergis Caye along with the San Pedro Food Bank at Collen's Kitchen started the Merry Boxes Campaign at the beginning of the month of December with the aim to bring much needed food and personal items to the less fortunate families of Ambergris Caye during the Christmas holiday. The boxes were labeled with items such as rice, canned soup, flour, tinned fruit, corn, cereal, toothbrushes and other items. Businesses and persons that adopted a Merry Box were encouraged to place at least 24 items per box that were not expired, unpackaged and unsealed. “This project made me aware of the number of families on the island that are in need of assistance in any way possible. It has also made me aware that the community is more than willing to assist the families through projects such as our Merry Boxes. I am very thankful to all my group members, individuals, and businesses who assisted in making this project a success. It has also made me appreciative of what I have in my life,” said Rotaract Member and Chairman of Merry Boxes Campaign Kyle Vasquez. Businesses and persons that adopted a Merry Box included Ambergris Vacation Rentals, Atlantic International Bank, ATM Golf Cart Rentals, Banyan Bay, Befit Belize, Belize Bank, Belize Pro Dive Center, Belize Social Security Board, Caldwell Banker, Caliente Restaurant, Caribbean Golf Cart Rental, Caye Supplies, Coldwell Bank, Corona Del Mar, CrossFit Wolf, Dive Bar, El Dorado, El Fogon Restaurant, Exotic Caye Beach Resort, Fido's Courtyard & Pier, Front Street Keller Williams, Grand Baymen Gardens, Grand Colony, Hidden Treasure, Holiday Hotel, Hope Haven, Hotel Del Rio , La Divina Providencia Store & Restaurant, La Sirene Resort and Spa, Lavish Habit Café, LC Distributor, Mahogany Bay Village, MarAlliance, Mike Coleman Construction, Mr. Deli, Marcelo Castillo, Craig Kovach, Paradise Ice Cream, Parham Plaza (Hostel La Vista), Playa Bar & Grill, Rotarian , San Carlos Medical Center, San Pedro Glass Shop, San Pedro RC School, San Pedro Sailing Club, The San Pedro Sun, Save On Supermarket, SP Hardware Ltd., SpinDrift Hotel , Studio Nintey-Three, Super Buy South, The Baker, The Coffee Bar, Toucan Stores, Truck Stop, Wayo's Bar, WOD Zone and Xanadu Island Resort. Organizers thank everyone who adopted a Merry Box. In addition, the Rotaract Club of Ambergris Caye welcomes new members between the ages of 18 to 30. If someone is interested in finding out more and how they can become a member, meetings are held at the clubhouse of Fido’s Courtyard from 1PM to 2PM on the first and second Thursdays of each month. You can reach out to any member, through their Facebook Page or contact Charter member Job Mendizabal at 633-9191 or email at [email protected] for more details.